Hello! Game #4 will soon be is uploaded to the moblet server; as moblet is a bit busy lately I will be moderating the beginning of this game. This server has been upgraded to the same specifications as Timothy's main 128 server, using Simutrans 111.0 stable as you can download from the forum download page, and pak 128 1.99 alpha r571, as you can download from here. If Timothy decides to upgrade his main server to the new 128 stable, this server will also be upgraded. Rules can be found here, these are again the same. Moblet and I will act as public player. Please read the rules and understand the territory system before playing! If you are not a native English speaker, I can try to help you understand the rules if they are unclear. All players in this game have been locked. To join the game, post in this thread and a game admin will send you a password by PM. Please state the color you want and what territory you would like (North, South, East or West) and whether you would like passengers/mail or freight. Is the starting map of the game available somewhere for download? As there is so much work put into it. Can I have north pax? I'd like east passengers please. I won't be here tomorrow and on Thursday, so I'll only be able to join during the weekend. @Dwachs: http://simutrans-germany.com/files/upload/Swiss_MP_v11.sve. I have all versions and devel files for building this map, just let me know if you want any of them. This is the version we are using now. @chor & ojii: I will PM you a password as soon as Timothy uploads the map (it is not yet live). Any color preferences? This map is now online, apologies for the delay! I would like south Freight, in green if available. i would like to joint this game in the north for freight , if it possible . Hi. Can I have South Pax please? Ideally a red/purple/yellow player colour please (ie not blue or green which are hard to see!). Buses in Knittern appear to have become stuck. Traffic crossing at 55,386 looks to be the trouble. Maybe route them via existing bridge at 55,393? @AP, thanks, I fixed it. Just as a note, I would like to give up my passenger player (west) if someone would like to take over a running network with over a billion in profit, as I would like to switch to freight. I would like to try again with south freight and if possible, expand to west freight. Jjatca, I have not sent you a password yet. As I know you like to play on other servers and often do not have the time to fully exploit all of the freight links in a territory, perhaps you want to do a joint network with AP? (As you can now give others trackage rights and make waytiles public by using the make stop public tool). And, AP, if you want WPax, it's yours. I agree, it's a good idea. The SPax rail network should be able to handle freight without any trouble provided it achieves 80km/h speed - that's the speed the passenger trains operate at (probably best not to route freight via the high-speed lines!). There are a few stretches of single track left, obviously those can be upgraded if needed, so long as we don't build new freight yards too close etc. Just make sure trains aren't more than 4 tiles long or they won't fit in the passing loops. I think the WestPax network seems to run itself pretty well, if I were you Fifty I'd just switch to freight, and we can all keep an eye on it if it needs tweaking. I've been trying to avoid unnecessary trackage, notably tunnels. I saw some of the bankrupt players had used unrealistically long tunnels, without the revenue to cover the maintenance on them. In particular if S Freight could avoid tunnels beneath urban areas - to allow future metro lines. I've fixed the boundaries (click for larger) for pax that I messed up in the first picture and made boundaries for a 2-freight player game. I'll do Northeast; Southwest password will be sent to Jjatca and AP. Red is freight, Green is Pax. No shared resource zones except for south Hajopolis. Purple X's are planned freight interchanges. As usual, pax players generally have final say over freight networks running around them. 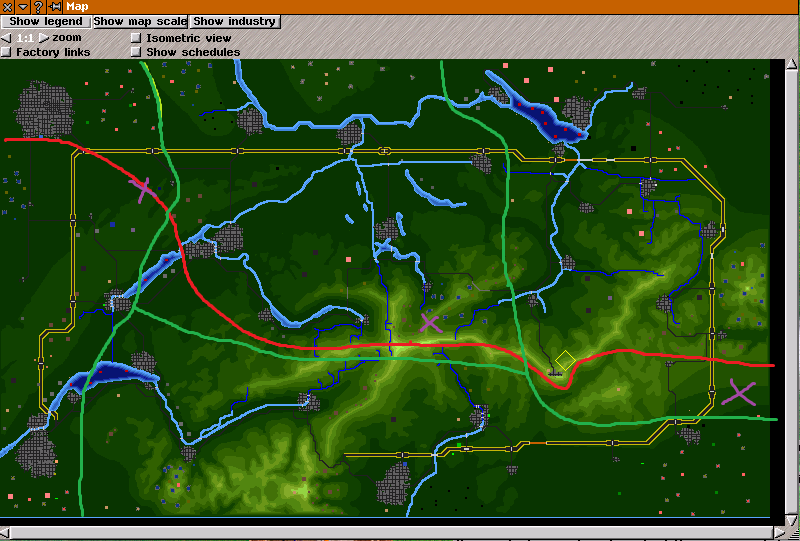 I've added lines to the marked freight interchanges from my network, for use by the new SouthWest Freight player. Just to note - the existing sPax network makes use of several sections of combined high-speed and low-speed traffic. When setting up new lines for freight, waypoints must be set to divert the slower trains into each overtaking loop along the route, to ensure the high-speed trains can pass without delay. It doesn't happen by accident! I want to transport people in Knitten, Hamsterdam, and Hajopolis. How's the game going? Still good? There is still a few Factories to put in lines to finish up the map, but no more than hour to do so (to find them and deliever), so perhaps a restart could be done. Yeah, I think it is time for a restart. Unfortunately, neither moblet nor I have much time in the near future If this continues, this server might shut down for a little while and players can play on the main servers. I am working on a new map and would love some input/suggestions. It seems like freight is a lot of work, but people finish up the pax networks in the first few weeks and then there is little to do, hence people are bored. I am experimenting with obey era games from 1940 and 1950 with bits_per_month increased to 23 or 24 to make obey era truly playable (about 1 day IRL per year) The challenge of upgrading should give players something new to do. I think perhaps also increasing the growth rates. But I am not a passenger player, so I would love to here some input from you all. I am playing ATM on 128.entropy mostly to try to understand what we need to keep a game playing for a longer. Timothy: as 1.99 savegames are, I think, fully compatible with 2.0, feel free to upgrade at any time. I agree. The map is "done", for the most part. Have to say, might be worth playing with a modified passenger profitability setting, if that can be done via a network, since the money seemed to skyrocket rather easily. My free time is intermittent at the moment, so it might be a while before I can play again. Ok, I am happy to restart it, with the same map? Yes , same map , but perhaps a few more factories that are interconnected within a players boundary could be added. Note for all: New map is in the works, but server is down right now as neither moblet nor I have time to administrate a new game. Hope to have it back up in a week or two -- feel free to check out the main 64 or 128 servers. It seems like map 4 had a lot of unserved/underserved industry, no? Or do you just want more interconnection? Several industries were unserviced since they did not receive an interconnection. A few more interconnections would be ideal.